My family has been growing green chilies in the family farm for generations. It might be because the region gets very less rains. The variety we grow is called Sankeshwari Chilies. It is moderately hot and moderately red in color. I remember we actually never buy chili powder from store as yearly supply is send to us by my uncle. In the past he also grew some Byadagi chilies just for home and mixed it with the Sankeshwari to give bright red color to the chili powder. I think later he stopped doing it. 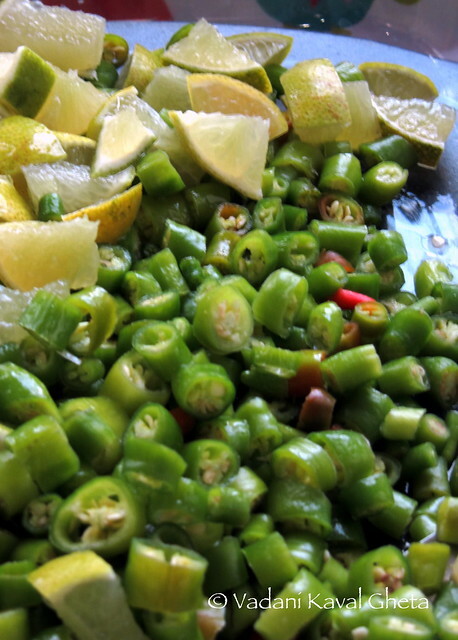 My Ajji used to make awesome pickles from chilies like Maeen Mula (sorry no picture) and green chilies, Green mangoes and chilies, Green Mangoes and Garlic and many more combinations. There is a very special pickle made in the region called Channyache Lonache (छन्न्याचे लोणचे). Channya is very similar to Parwar. But I am not hundred percent sure about how close these two vegetables are to each other. But my favorite pickle is Chili Lime Pickle as it is the most flavorful pickle in my opinion. Softened green chilies, creamy mustard and perfect sourness of limes makes it to die for! I love to eat this pickle with home churned butter and bread toast. Another favorite combination is this pickle, soft warm Idli and butter! Oh! heaven in mouth! If I remember correctly, this pickle is made in winter time as that is the season when Fresh chilies are available in abundance. It needs nice and juicy limes as well. I say limes because traditionally we get limes in abundance in India and very rarely lemons. But here in US I have used both lemons and limes and it produces similar results. These days I tend to use more lemons because lots of our neighbors have lemon trees and I get steady supply of pesticide free lemons in the pickle season. And I get to make many many varieties of lemon pickles! Choosing correct spice level for green chilies is very important step. I think spicy is not always tasty because it kills other flavors of the dish and it is particularly true with this pickle. I choose medium spicy long light green chilies from nearby farmers market. Wash green chilies under running water without crushing them. Let them dry completely on paper towel overnight in single layer. Also wash the lemons and dry them overnight in single layer. We do not want even a single drop of water on either lemons or chilies. Next day first dry roast 2 tbsp methi seeds and cool them. Grind to make coarse powder. Grind mustard seeds coarsely and set aside. Heat oil in a small kadhai. Add 2 tbsp methi seeds, hing and turmeric powder. As soon as the methi seeds start sizzling add ground methi seeds and ground mustard seeds. Let mustard seeds sizzle for a minute and shut the heat off. Let the oil cool down to room temperature. Discard all the stems from chilies. Discard chilies that are broken or have black spots. And make sure each and every chili is dry and there is not a single drop of water on it. Clean lemons and dry them with towel. Now start cutting chilies with dry knife and dry cutting board. Cut the chilies in 1 centimeter length. Keep them in a deep bowl. Now squeeze juice 5 lemons and set aside. Chop remaining lemons in 1 centimeter pieces. Add these to the chilies. Mix about 2-3 tbsp salt and lemon juice with chili-lemon mixture. Let it sit down until oil is cooled down completely. Mix oil with the chili-lemon mixture and mix it thoroughly. Adjust salt if necessary. Now layer about a teaspoon salt in a glass jar and fill in the pickle. Continue with the process until all the pickle is bottled. Now add single layer of salt on top of pickle. Close the lids tightly. My mom used to open bottles every 2-3 days and mix and keep it cool and dry place until chilies are softened. I realized that my pickle invariably goes bad if I do that so I do not open the bottles for almost a month. Recently I have been using 8oz mason jars, pickle stays fresh for long time and one can use only one small bottle as needed. I have also left my pickle bottles in fridge for almost a moth without touching it to avoid spoiling it. Keep your hands, all the ingredients and utensils dry is the key to make pickle that lasts. Also not washing your hands frequently during the process is important. 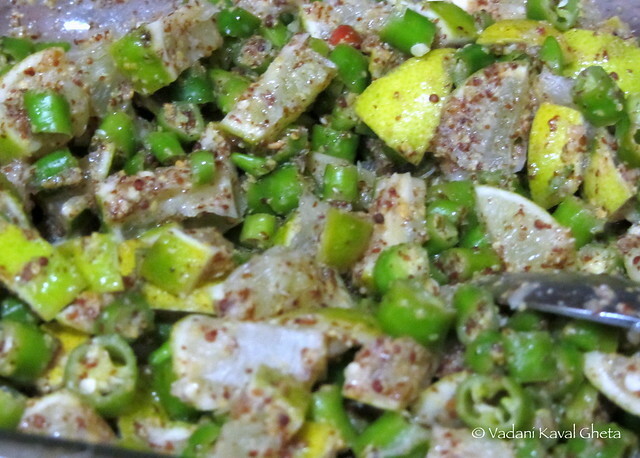 Another very interesting recipe I cam across on Maayboli was to grind mustard seeds with lemon juice to make it more spicy. 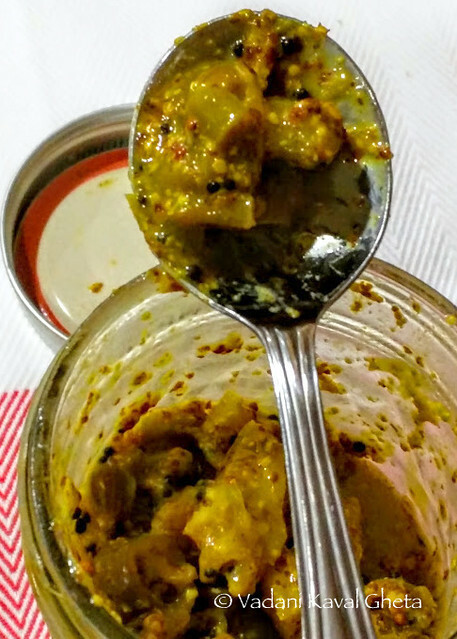 In that pickle tempering is only made from methi seeds, hing and turmeric powder. It also tastes heavenly.